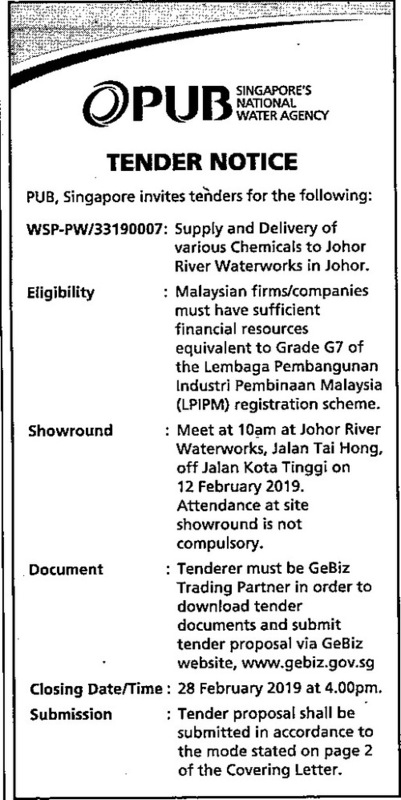 WSP-PW/33190007: Supply and Delivery of various Chemicals to Johor River Waterworks in Johor. Eligibility : Malaysian firms/companies must have sufficient financial resources equivalent to Grade 67 of the Lembaga Pembangunan Industri Pembinaan Malaysia (LPIPM) registration scheme. Showround : Meet at 10am at Johor River Waterworks, Jalan Tai Hong, off Jalan Kota Tinggi on 12 February 2019. Attendance at site showround is not compulsory. Closing Date/Time: 28 February 2019 at 4.00pm. Submission : Tender proposal shall be submitted in accordance to the mode stated on page 2 of the Covering Letter.